Hardening is a process in which steel is heated to a temperature above the critical point, held at this temperature and quenched (rapidly cooled) in water, oil or molten salt baths. As earlier mentioned that if a piece of steel is heated above its upper critical temperature and plunged into water to cool it an extremely hard, needle-shaped structure known as martensite is formed. In other words, sudden quenching of steel greatly increases its hardness. However, in order to harden, the carbon content in the work piece should be at least 0.25%. Therefore, dead mild steel cannot be hardened in this way. Mild steel will also harden slightly for specimens containing over 0.25% carbon. Higher the carbon percentage, higher will be resulting hardness. Hardened pieces become brittle and their extreme brittleness becomes a great disadvantage. They tend to fail in-service. 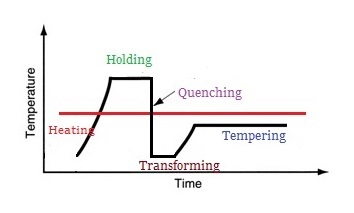 Therefore hardening process is invariably followed by a tempering process. Adequate carbon content to produce hardening. Austenite decomposition to produce pearlite, bianite and martensite structure.